After two refreshing years with a sceptic Prime Minister Australia is sliding into the Warmist camp following the election of Malcolm Turnbull. There will be no more investigations of data tampering at the BOM and I hate to see what we are going to agree to in Paris . Jennifer Mahorasy has a fine article in the Australian which is reproduced in full here. No conclusions could be drawn because the panel did not work through a single example of homogenisation, not even for Rutherglen. Rutherglen, in north­eastern Victoria, is an agricultural research station with a continuous minimum temperature record unaffected by equipment changes or documented site moves but where the bureau nevertheless adjusted the temperatures. This had the effect of turning a temperature time series without a statistically significant trend into global warming of almost 2C a century. According to media reports last week, a thorough investigation of the bureau’s methodology was prevented because of intervention by Environment Minister Greg Hunt. He apparently argued in cabinet that the credibility of the institution was paramount — that it was important the public had trust in the bureau’s data and forecasts, so the public knew to heed warnings of bushfires and ­cyclones. Hunt defends the bureau because it has a critical role to play in providing the community with reliable weather forecasts. This is indeed one of its core responsibilities. It would be better able to perform this function, however, if it used proper techniques for quality control of temperature data and the best available techniques for forecasting rainfall. There has been no improvement in its seasonal rainfall forecasts for two decades because it uses general circulation models. These are primarily tools for demonstrating global warming, with dubious, if any, skill at actually forecasting weather or climate. Consider, for example, the millennium drought and the flooding rains that followed in 2010. Back in 2007 and 2008, David Jones, then and still the manager of climate monitoring and prediction at the Bureau of Meteorology, wrote that climate change was so rampant in Australia, “We don’t need meteorological data to see it”, and that the drought, caused by climate change, was a sign of the “hot and dry future” that we all collectively faced. Then the drought broke, as usual in Australia, with flooding rains. But the bureau was incapable of forecasting an exceptionally wet summer because such an event was contrary to how senior management at the bureau perceived our climate future. So, despite warning signs evident in sea surface temperature patterns across the Pacific through 2010, Brisbane’s Wivenhoe dam, originally built for flood mitigation, was allowed to fill through the spring of 2010, and kept full in advance of the torrential rains in January 2011. The resulting catastrophic flooding of Brisbane is now recognised as a “dam release flood”, and the subject of a class-action lawsuit by Brisbane residents against the Queensland government. Indeed, despite an increasing investment in supercomputers, there is ample evidence ideology is trumping rational decision-making at the bureau on key issues that really matter, such as the prediction of drought and flood cycles. Because most journalists and politicians desperately want to believe the bureau knows best, they turn away from the truth and ignore the facts. News Corp Australia journalist Anthony Sharwood got it completely wrong in his weekend article defending the bureau’s homogenisation of the temperature record. I tried to explain to him on the phone last Thursday how the bureau didn’t actually do what it said when it homogenised temperature time series for places such as Rutherglen. Sharwood kept coming back to the issue of “motivations”. He kept asking me why on earth the bureau would want to mislead the Australian public. I should have kept with the methodology, but I suggested he read what Jones had to say in the Climategate emails. Instead of considering the content of the emails that I mentioned, however, Sharwood wrote in his article that, “Climategate was blown out of proportion” and “independent investigations cleared the researchers of any form of wrongdoing”. Nevertheless, the content of the Climategate emails includes quite a lot about homogenisation, and the scientists’ motivations. 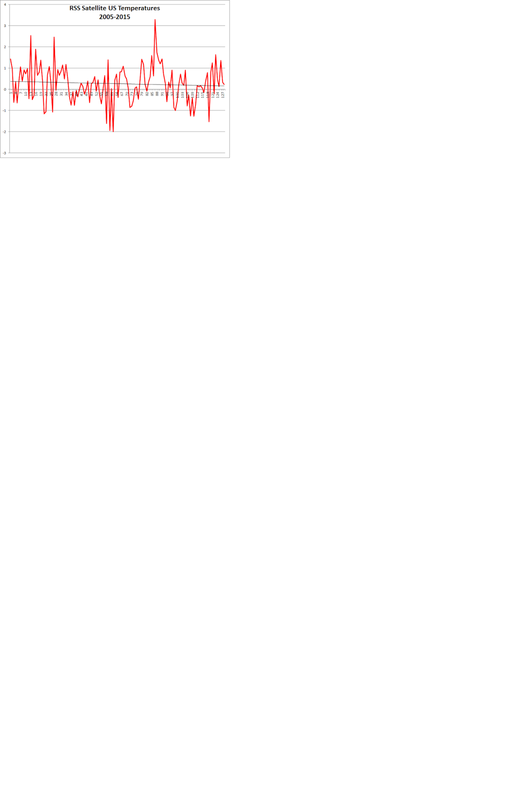 For example, there is an email thread in which Phil Jones (University of East Anglia) and Tom Wigley (University of Adelaide) discuss the need to get rid of a blip in global temperatures around 1940-44. Specifically, Wigley suggested they reduce ocean temperatures by an arbitrary 0.15C. 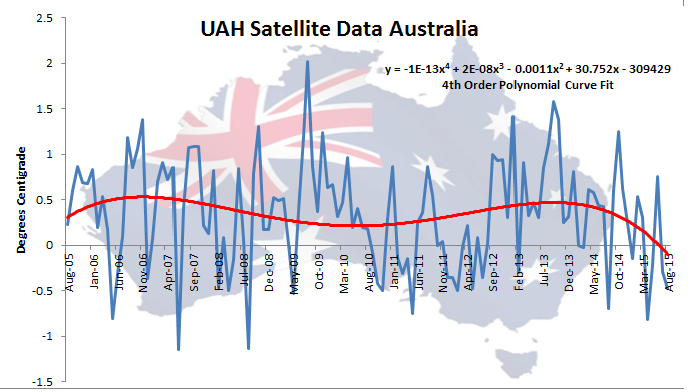 These are exactly the types of arbitrary adjustments made throughout the historical temperature record for Australia: adjustments made independently of any of the purported acceptable reasons for making adjustments, including site moves and equipment changes. In fact, many (not most) weather stations have moved from post offices to airports, which have hotter, not cooler, daytime temperatures. Furthermore, the urban heat island creeps into the official temperature record for Australia not because of site moves but because the record at places such as Cape Otway lighthouse is adjusted to make it similar to the record in built-up areas such as Melbourne, which clearly are affected by the urban heat island. I know this sounds absurd. It is absurd, and it is also true. Indeed, a core problem with the methodology the bureau uses is its reliance on “comparative sites” to make adjustments to data at other places. I detail the Cape Otway lighthouse example in a recent paper published in the journal Atmospheric Research, volume 166. It is so obvious that there is an urgent need for a proper, thorough and independent review of operations at the bureau. But it would appear our politicians and many mainstream media are set against the idea. Evidently they are too conventional in their thinking to consider such an important Australian ­institution could now be ruled by ideology. Hottest Year in the US? 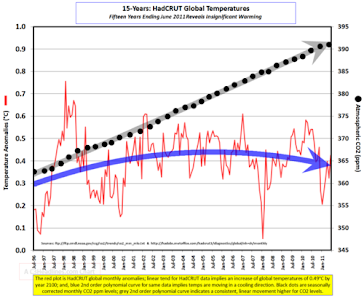 NOAA is not broadcasting their accurate data showing cooling! The USCRN network was set up in the US to provide an accurate temperature record which requires almost no adjustment. Unfortunately for the global warming catastrophists the results show cooling over the last 10 years which is not the news required for the doom-and-gloom December meeting in Paris. They are definitely not interested in accurate data. The U.S. Climate Reference Network (USCRN) is a system of climate observing stations developed by the National Oceanic and Atmospheric Administration (NOAA). The USCRN's primary goal is to provide long-term temperature, precipitation, and soil moisture and temperature observations that are of high quality and are taken in stable settings. Data from the USCRN are used in a variety of climate monitoring and research activities that include placing current climate anomalies into an historical perspective. The USCRN provides the United States with a reference network that meets the requirements of the Global Climate Observing System (GCOS). The network consists of 114 commissioned stations in the contiguous United States, 16 stations in Alaska (with a plan to eventually have a total of 29), and 2 stations in Hawaii. The USCRN Program Manager is Howard Diamond. The program is managed and coordinated by the National Centers for Environmental Information, a component of NOAA's National Environmental Satellite, Data, and Information Service (NESDIS). 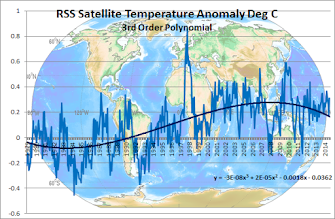 When we compare this with the RSS satellite temperatures for the US for the same period we get an almost identical graph confirming the accuracy of the RSS data. The RSS data is also showing cooling. Note the RSS data is in Celsius but can't be compared in magnitude as it is measuring the lower troposphere . David Cameron says that the UK will spend more that 5 billion pounds on climate change in poor countries but the amount will be deducted from the UK's foreign aid budget. How blessed will the starving peasants feel when their brand new wind turbine arrives instead of a ship load of food. This man , elected by a bunch of geriatrics in Rome fancies himself as a world politician and science expert as he traipses around the world in his Dopemobile. He is in good company when in the US he joins with the Moron-in-Chief to promote the global warming scam and other liberal causes. Pope Francis has built up a liberal fan club with his encyclical against global warming, the recognition of Palestinian statehood and an attack on unfettered capitalism (“the dung of the devil”). The Pope should be concentrating on his own back yard where up to 5% of his priests are involved in child abuse and children are not safe in the church. "Suffer the little children to come unto me" takes on a whole new meaning with his lot. Meanwhile the Catholic Church he heads , with its billions in wealth ,sees no need to distribute it's amassed riches among the world's poorest as the money-changers that Christ chased from the temple are back in force still running around in funny medieval costumes . Makes one wonder where the "dung of the devil" really reside! Take the NOAA map above. 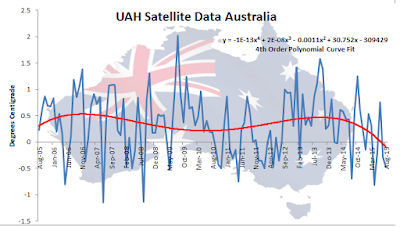 Check Australia, said to have had average or above-average temperatures over much of the continent, apart from the much-warmer-than-average bits around Sydney and parts of Western Australia. 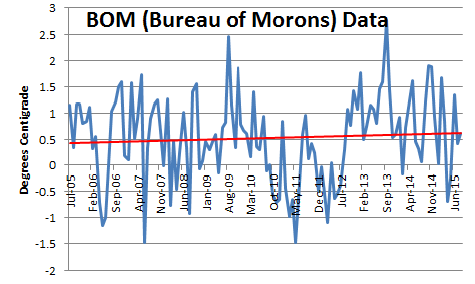 HOW DOES THE COLDEST MONTH IN 20 YEARS BECOME THE HOTTEST MONTH “EVER’’ ? However, have close look at the below map produced by the National Oceanic and Atmospheric Administration (NOAA) an Obama Government agency (the same people that assert that July 2015 was the hottest month ever). NOAA assert that temperatures in Melbourne for July 2015 were “Warmer than Average” and for Sydney they were “Much warmer than average”. Or take Adelaide, which the NOAA map claims had average temperatures. Bureau of Meteorology Senior Forecaster Mark Anolack said ... “July certainly was cooler than average… Generally around Adelaide we have about 15.3 degrees (Celsius) as an average maximum temperature. Brisbane‘s average monthly maximum in July was 18.1, considerably cooler than the usual 18.9. Why is the NOAA map for Australia running so very warm?